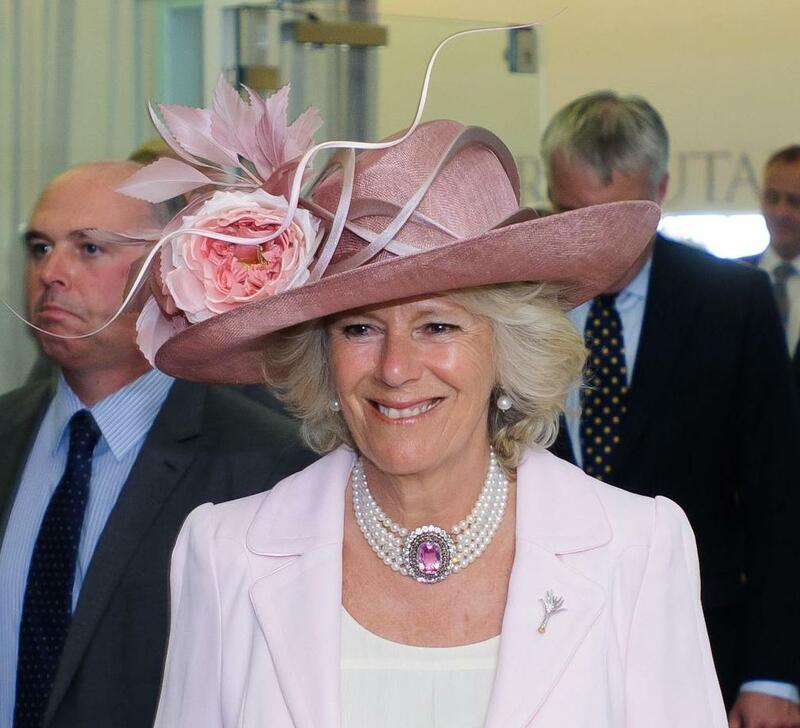 With a big pink stone right at its heart and a gorgeous pair of earrings to match, The Duchess of Cornwall's Five Strand Pearl Choker with Pink Topaz Clasp is my personal favorite member of her extensive pearl necklace collection. The clasp features an oval pink topaz stone surrounded by a ring of diamonds in a delicate scrolling design and a ring of collet-set diamonds on the outside. 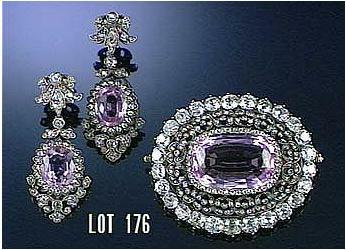 She also has matching earrings, each with an oval pink topaz in a foliate diamond design. 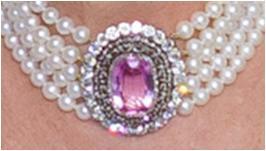 The diamonds used in the pieces are rose and cushion-cut. We know some of the details of the history of this set, and other details have been assumed. It has been widely reported that the jewels were a gift from The Prince of Wales (some have even said they were his wedding gift to her); while I agree with that assumption, I do not believe that it has been officially confirmed. What we know is that the pink topaz and diamond center, which had a detachable brooch setting, and the earrings were sold at a Sotheby's auction in June 2000 for £22,925. According to the auction notes, the pieces date from the 1830s and are thought to have once been part of a larger jewel such as a tiara or necklace. Many have assumed they were purchased directly from Sotheby's by The Prince of Wales, but they were not worn publicly by The Duchess until several years later. They have certainly been in The Duchess of Cornwall's collection since at least 2006. The earrings were worn to a dinner in Pakistan that year. The necklace was first worn in a longer version with the clasp at the side before being shortened to the choker style we know today. The current format was first seen on The Duchess at the May 2008 wedding of Peter Phillips and Autumn Kelly. The set has been worn for both evening and day engagements; day engagements are more likely to be high-profile royal events (weddings, Trooping the Colour, Royal Ascot, etc.) instead of regular day-to-day appearances. As she often does with her demi-parures, Camilla regularly wears the earrings and choker separately. With such a wonderful color in the pink stones and such a regal setting, any appearance of the set is guaranteed to get a rave review from me. Appearances include those from the date the entry was published, and only those featured on the blog previously.